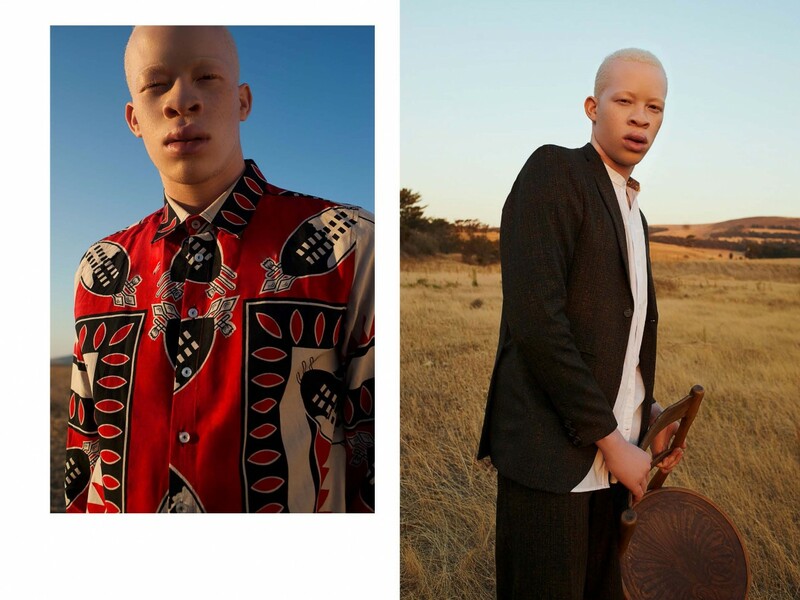 Sanele Junior Xaba is a Cape Town based model and the first albino male to win South Africa’s fashion spotlight. In this interview we get to know him a little better and learn about the strains of putting up with skin-condition related bias. 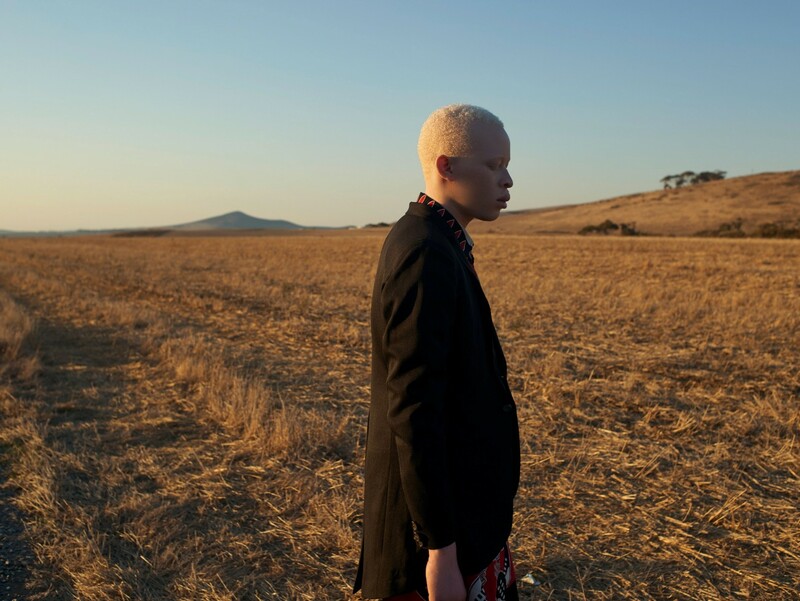 The story below, captured by the fervid lens of photographer Amelie Rehm, portrays Sanele in the warm light of Cape Town’s Wets Coast backdrop, wrapped in Unknown Union, a label and fashion project that solicitously integrates local communities in the creative growth of the region. 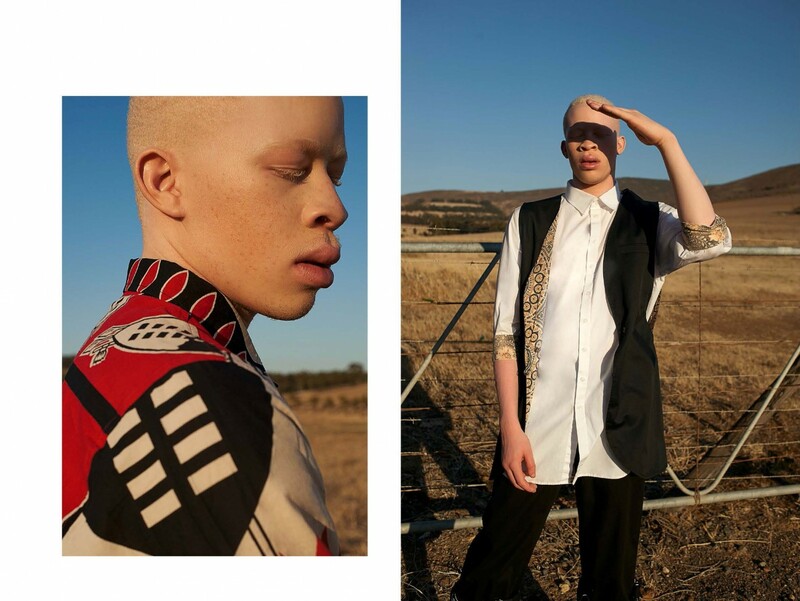 In addition to being the label’s ambassador, the rising model is highly committed to fighting discrimination and paving the way for other albino models. Œ Magazine: Do you recall the first time you were aware of your extraordinary looks? Sanele: I think I was always quite aware of my appearance. I always thought of my albinism as of another shade and didn’t let myself feel any different then other people because of it. Œ Magazine: It is known that in certain African states, like Tanzania, children with albinism are picked on and mistreated. What was growing up in South Africa like for you? Sanele: It is known and really is sad, and I believe education to be the only solution. I had a fairly good childhood and was lucky enough to be surrounded by people who understood my condition and taught me about it early in life. Œ Magazine: So you never felt insecure about your appearance? Sanele: Well, as a teenager I had my share of kids bullying me in school, but in the long run all the adversity made me into the man I am now. Œ Magazine: What led you to modeling? Did modeling change the image you have of yourself? Sanele: I was scouted at the age of 15 by an agency in my neighborhood. Modeling made me love and appreciate my “uniqueness” even more, but it also made me aware of the need for diversity in the South African modeling industry. Œ Magazine: Your job gives you the opportunity to travel a lot; did you observe any difference in people’s reaction to your look in other parts of the world? 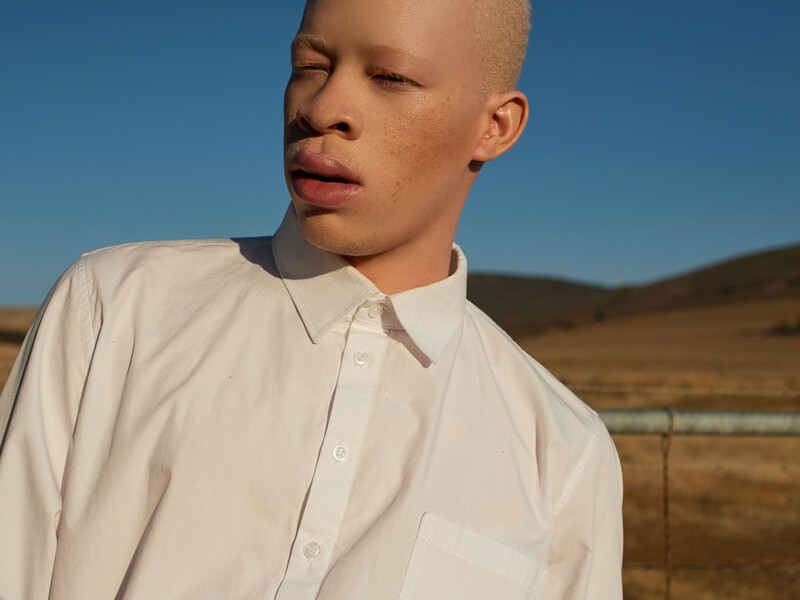 Sanele: Mostly people are stunned, some would call me “porcelain Ken doll”, and of course there’s always a few ignorant folks coming at me with insulting questions. 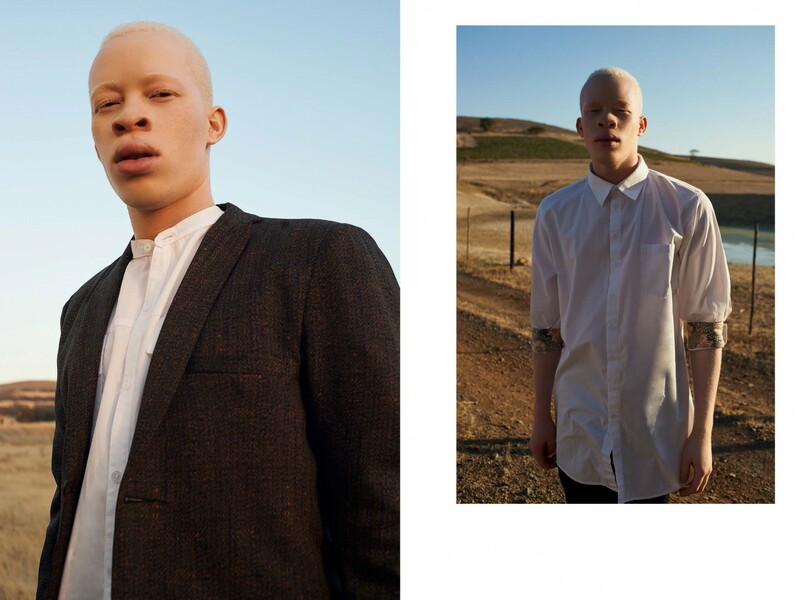 Œ Magazine: Did any client ever try to take advantage of the fact that you are albino? Sanele: No. I’ve been lucky enough to work with really cool clients and respectful people who share my sentiments. Œ Magazine: Given your exposure, do you feel any pressure or responsibility to spread and promote sensitivity and acceptance towards albinism? Œ Magazine: You are ambassador of the up-and-coming Cape Town based label Unknown Union. Can you tell us a little bit about the brand and the idea behind its work? Sanele: Unknown Union is an art and culture driven fashion project. The idea and the challenge is to root the company among vibrant communities, outside mainstream fashion, in order to create a platform where the local design and aesthetics can flourish. Ultimately the goal is employing members of these communities to both inspire and manufacture quality collections for the “global citizen”. 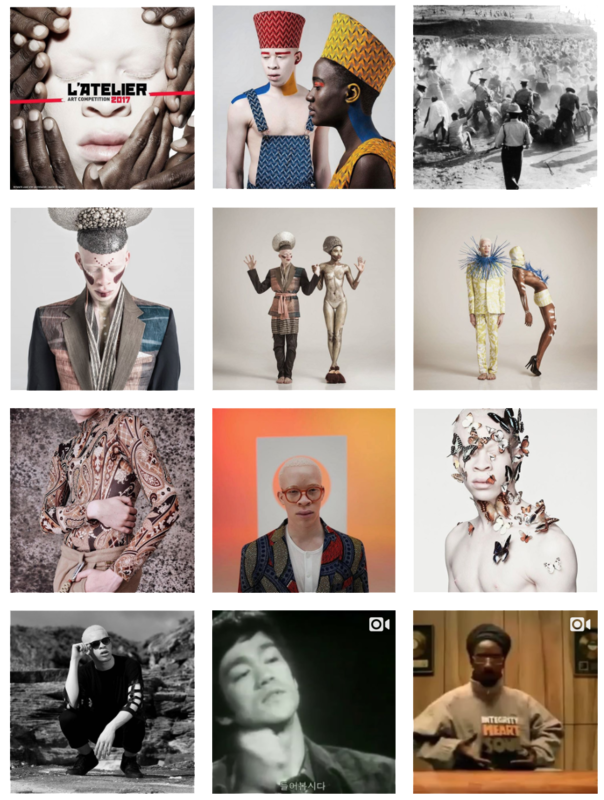 Œ Magazine: Do you think the fashion world is doing a good job promoting individuality and diversity? Sanele: I feel like there has been a lot of improvement over the past few years, and that there is potential for it to keep getting better. Some brands like Adidas and Nike are doing a great job! Œ Magazine: How do people in South Africa stand towards self-expression in things fashion and personal style? Sanele: I feel like South Africans are much into following trends, but we are so rich in culture and tradition, and its quite amazing how some of the designers and new cats are embracing them in their work. Œ Magazine: What is something people in South Africa are open-minded about and Europeans struggle with? Sanele: I would say “the past”? Compared to Europeans, I think people in South Africa have a way of remembering those who paved the way for them… but then I guess that’s not a matter of open mindedness, and we are not all the same, so it’s hard to point out one thing. Œ Magazine: Your personal style and everyday-life clothes are quite extravagant; were you always interested in fashion? Sanele: I always loved expressing myself through fashion and believe in “looking good”. I can’t wait to get to Berlin so I can go thrift shopping! Œ Magazine: And what are your plans for the near future? Sanele: My plan is to travel the world while continuing to teach kids in school about albinism and different skin conditions. I also aim to grow my Rolled Sleeves Outreach, a program that provides orphanage with second hand stationary, and collects uniforms in good conditions.